We will create your customized T-shirts and Sweatshirts using your ideas or ours. 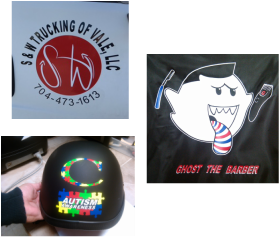 We also provide vehicle lettering, decals, yard signs, and banners. No job too small. 704-736-9960. 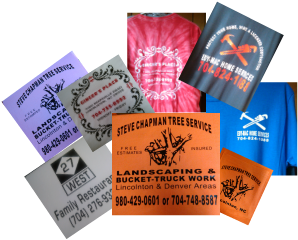 Contractors & Crews, Restaurants, Cafes & Grills, Sports Teams, Church Groups, Etc.... Look professional while letting your customers know who you are. 704-736-9960.